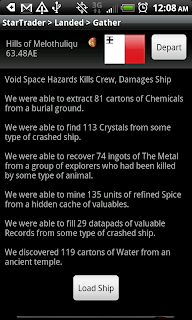 Over the long weekend, we released a new blast of story content. Episode 2 Act 2 includes 9 new dungeons, 7 new monster types, 2 new towns, and multiple new or continued story arcs. Episode 2 Act 2 opens up the world in exciting ways, expanding the scope of Steel, and helping to remove arbitrary geographic borders. More than ever before you can approach the world as you please, going where you want and choosing which adventures to take. Having passed the exciting milestone of completing 50% of the game's epic story, it seemed like a good time to tally some numbers and publish a status for the entire Heroes of Steel KickStarter project. To help with this, I created the following Heroes of Steel status info-graphic. 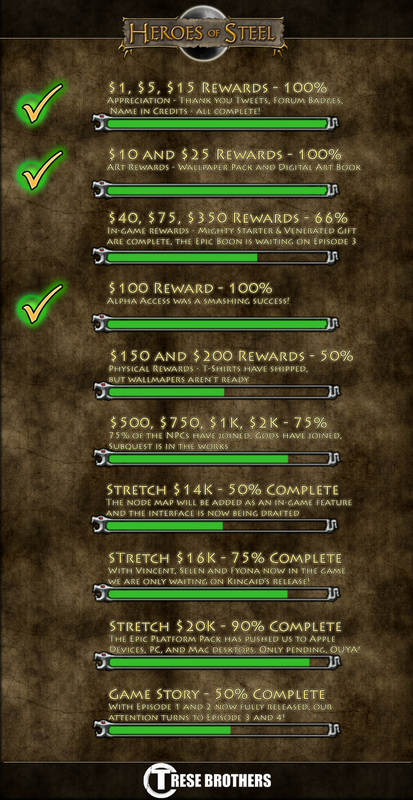 It groups the different rewards, stretch goals, and commitments into categories (Art Rewards, Physical Rewards, etc) and shows in summary how far we are into completing each category. Play Heroes of Steel today on your Android, iPhone, PC or Mac desktop!